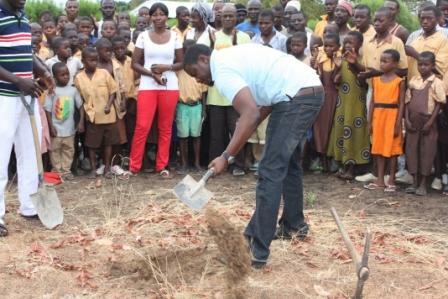 At the Ground breaking ceremony, Mr.Dumelo stated that the initiative was the first of many to come. He remarked that his choice for Baayire was because he identified the community as being one of the most deprived Villages in the Upper West Region of Ghana. "I stand for quality Education. “ He said. "I would not have made it this far without the Education I received and, I believe that all children deserve an opportunity to maximize their full potential" He added. 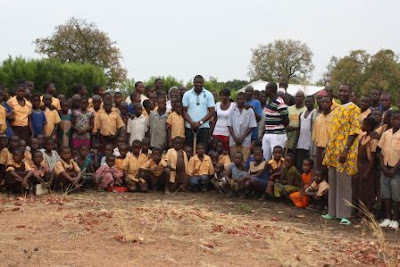 Each year, The Amara Foundation will choose a village out of the Ten Regions in Ghana and, determine ways to improve their Educational infrastructure. John Dumelo I swear, If yu'll just wink @ me, wallahi, i'll leave my husband and elope wit yu; my Dark Angel! This guy is too much. well, if only genevive nnaji will do something like this. I give this guy n d likes of mercy johnson kudos that are doing things dat actually matter! Genevive is a blessed woman but when asked what she had done to encourage other people in d industry in her cnn interview, she had nothing to say. I will like to hear dat she did something like this or the people dat need money for health issues, she can come to their rescue or something. its not good to chop money alone oo and if she has done things like this, then i take it back n kudos to her. pls dont bite my head off, it's just that i hvnt heard or maybe just don't remember now. Anyway, all the other actors, van vicker, nadia buari, ebube nwagbo--its not just partying!, do something to help ya community. i will if i had the money n i still wilo cos my money is definitely coming!!! Its good to know that he has a humanitarian side. Not only Genevieve. What about Ramsey noah or Emeka ike or Ini edo? How far with Jim iyke? He just wanted to eat money. Very few of them care about charity work. John Dumelo, i love you pass! A hot guy with a heart. Mmm mmm mmm.